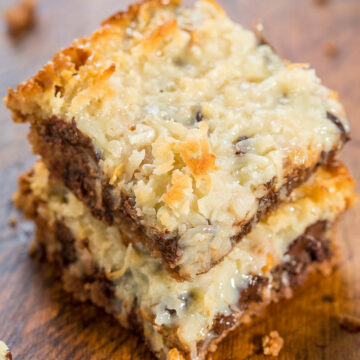 I’ve always loved Seven Layer Bars or Magic Bars. Same recipe but people call it by different names depending on where they live. 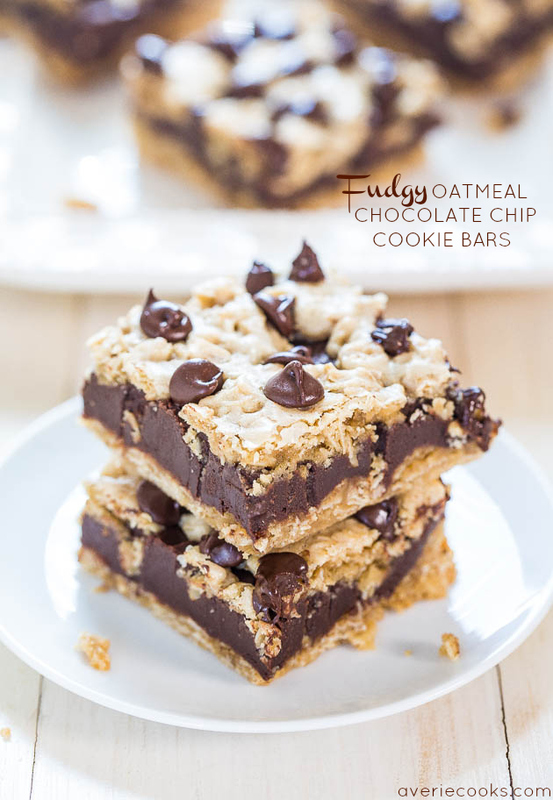 The bars are super soft, gooey, decadent, and have an amazing amount of texture and different flavors in every bite. It’s a one-bowl, no mixer recipe that’s fast, easy, and goofproof. Waiting for them to cool is the hardest part. Rather than making the bars with a classic graham cracker crust, I made a chocolate chip cookie crust. 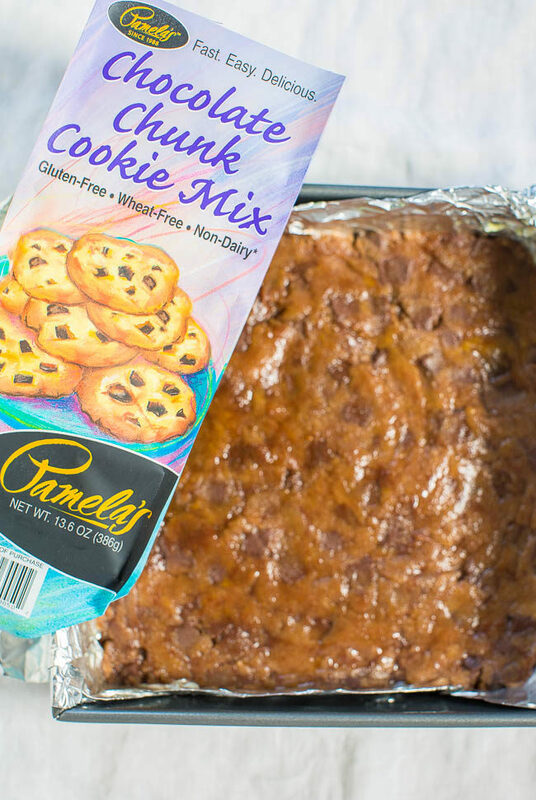 I used one package of Pamela’s Gluten-Free Chocolate Chunk Cookie Mix. The crust is so easy because all you do is stir together melted butter, the mix, an egg, and press it into the pan. The cookie crust was a great twist and we loved it. Adding chocolate chips boosts the overall chocolate factor, and instead of the traditional butterscotch chips I used peanut butter chips because you can never have too much peanut butter. 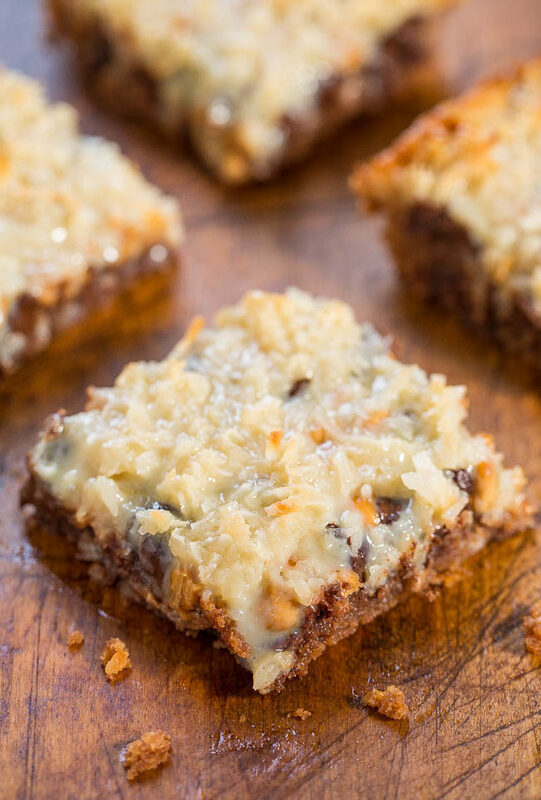 The coconut adds chewiness and texture while the creamy sweetened condensed milk coats the ingredients and gives the bars their signature gooey factor. And just like magic, the bars disappeared so fast. 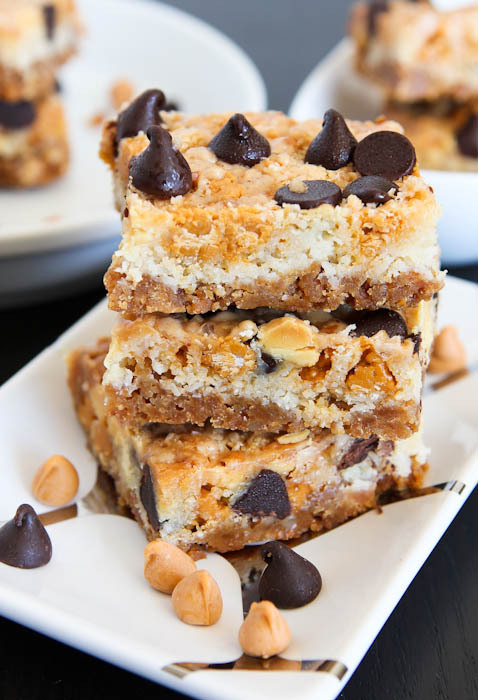 I’ve always loved Seven Layer Bars or Magic Bars. Same recipe but people call it by different names depending on where they live. 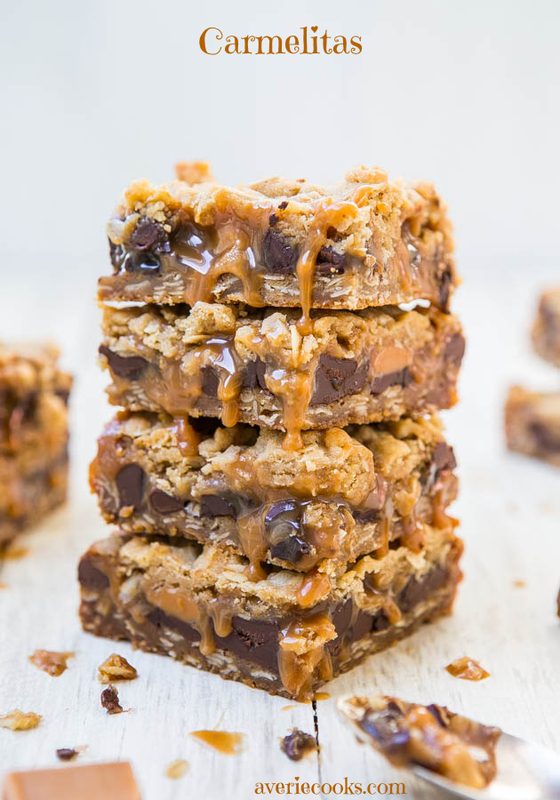 The bars are super soft, gooey, decadent, and have an amazing amount of texture and different flavors in every bite.It’s a one-bowl, no mixer recipe that’s fast, easy, and goofproof. Rather than making the bars with a classic graham cracker crust, I made a chocolate chip cookie crust. Chocolate chips boost the overall chocolate factor, and instead of traditional butterscotch chips I used peanut butter chips. 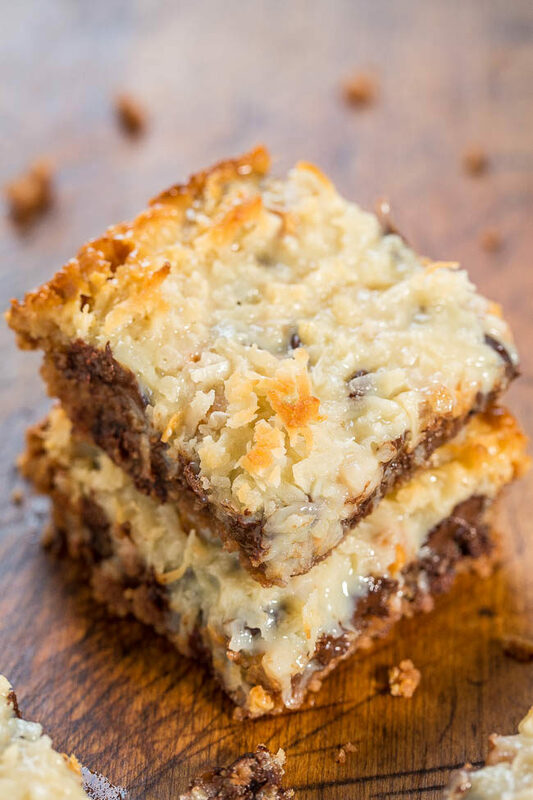 The coconut adds chewiness and texture while the creamy sweetened condensed milk coats the ingredients and gives the bars their signature gooey factor. Preheat oven to 350F. Line an 8-by-8-inch baking pan with aluminum foil, spray with cooking spray; set aside. Do not skip lining your pan because clean-up will be more difficult. Add the cookie mix, egg, and stir to combine. Turn dough out into prepared pan and using a spatula or your fingertips, create an even, smooth, flat crust. 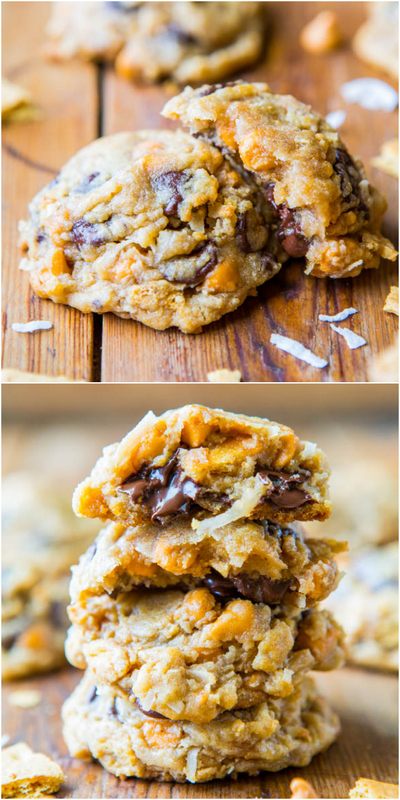 Evenly sprinkle with the chocolate chips, peanut butter chips, and coconut. 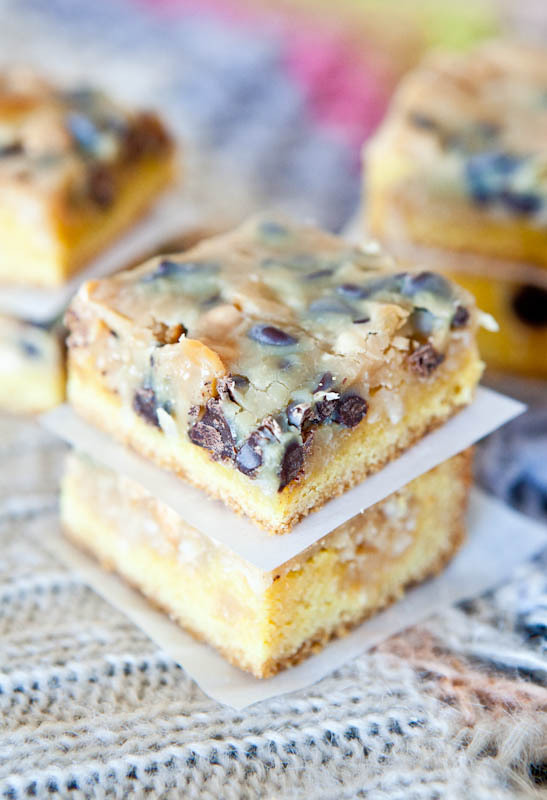 Evenly drizzle sweetened condensed milk over the top. Bake for about 30 minutes (I baked 27), or until lightly golden brown around edges and barely bubbling in the center, and the center is mostly set. 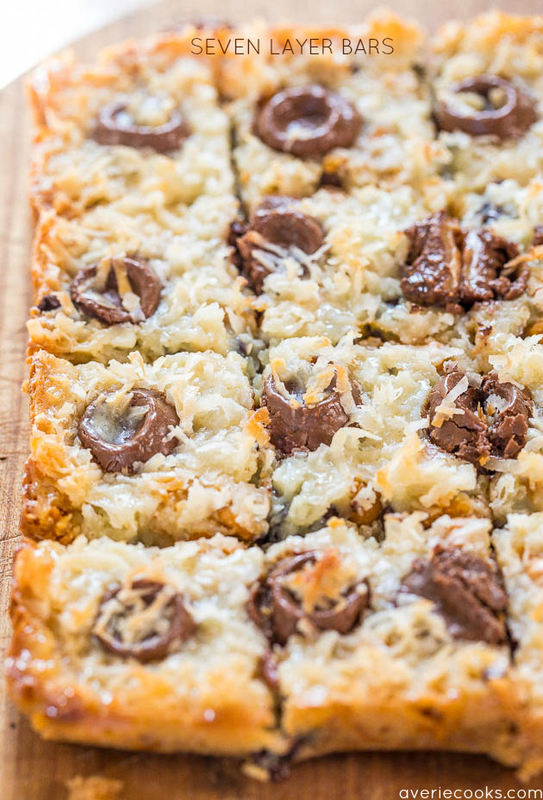 Keep an extremely close eye on bars in the final 10 minutes of baking because coconut can go from raw-looking to burnt in one minute. If necessary, tent the pan (cover pan with a sheet of foil) in the last 5 minutes of baking to help prevent the coconut from burning if center isn’t quite set but coconut is looking browned enough. Place pan on a wire rack and allow bars to cool in pan for at least 2 hours, or overnight, before slicing and serving. Bars firm up and will look less ‘juicy’ as they cool, however even when fully cooled and set, they’re very moist and juicy. Bars will keep airtight at room temperature for up to 1 week, or in the freezer for up to 6 months. 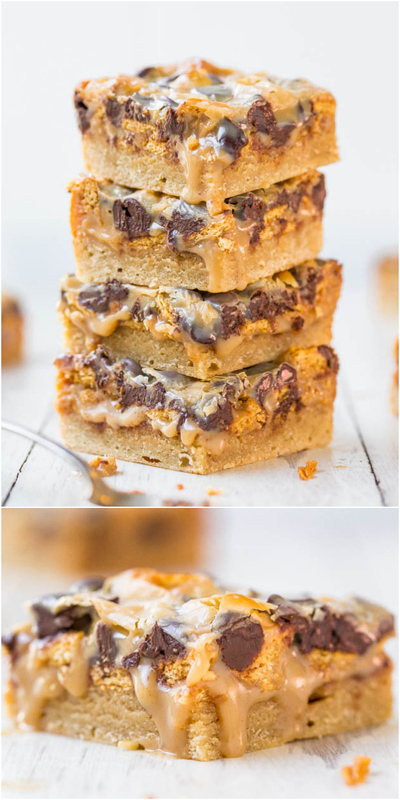 Seven Layer Bars – The classic bars with Rolo candies baked in! 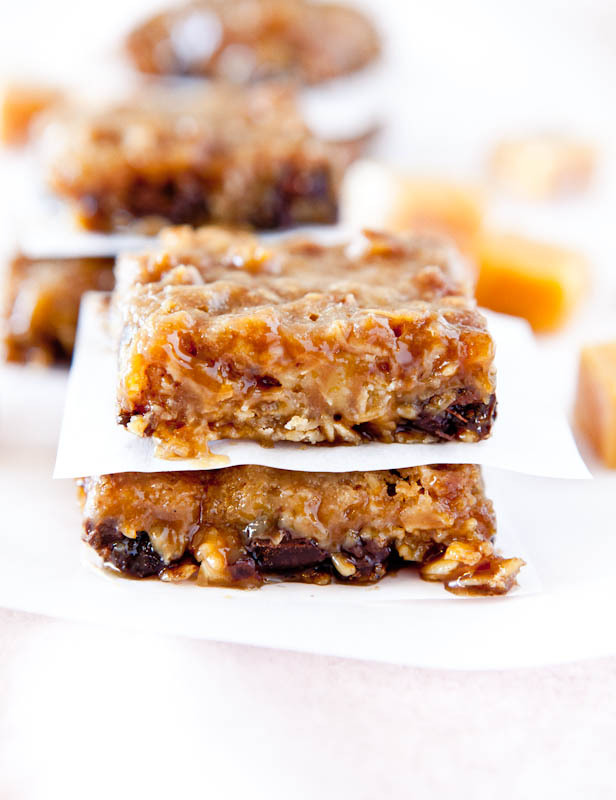 Magic Eight Bars – The classic, made with an extra layer! 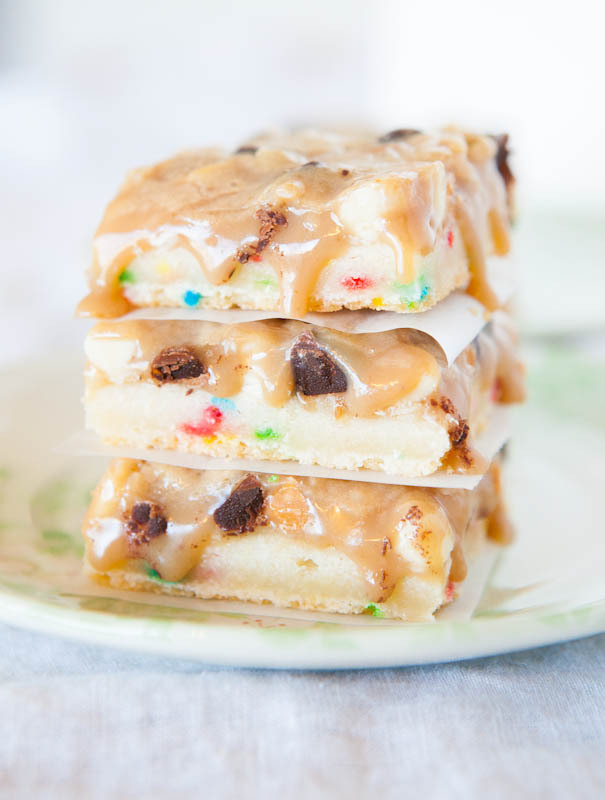 Cookie Butter Funfetti Triple Chip Bars – Now you know what to do with your cookie butter! Post is brought to you by Pamela’s. The recipe, text, images, and opinions expressed are my own.